There's something relaxing about the calm waters of a bay or lagoon. From early morning sunrise with a cup of coffee, to breathtaking sunsets while enjoying your favorite beverage. Not to mention the numerous water activities these waters can offer. Avoid the hustle and bustle of beachfront properties, while still enjoying the calming water. 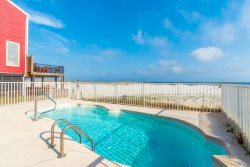 Browse and book our lagoon and bayfront rentals along Alabama's waterways for a relaxing Alabama Gulf vacation. Contact our office for assistance finding the right rental for your trip!